Hi ladies! Thank you so much for your support. I just love our amazing community!! It’s hard to believe that just one month ago, I began the transition from my former website here. If you’re new to the blog, thank you so much for checking it out... I hope you’ll stick around and find out all of the amazing things that we have in store for 2016!! This week, I've partnered with some AMAZING and talented bloggers to bring you a GIANT Blog Hop giveaway!! So if you're stopping by my blog today, you are on the first stop to the opportunity to win some really fun prizes!! 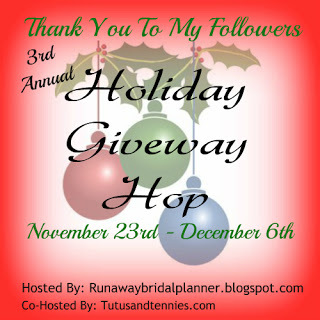 What is a Giveaway Blog Hop? At the end of this post, you'll find a list of all of the fantastic bloggers who are part of the giveaway. After you enter this one, you can click on each name on the list to enter theirs! Each blog you visit, has the same list posted at the bottom. We want to make it easy for you to visit and quickly enter tons of great giveaways, and give you a chance to connect with some fantastic blogs you might not have otherwise. On my blog, you can enter to win an Amazon gift card. I'm kind of obsessed with Amazon, and the great part is you can spend this on you or a loved one! Click on the RaffleCopter Form below to enter! It's that simple! This giveaway is sponsored by RachelMcMichael.com and open worldwide to readers 18+, void where prohibited. a Rafflecopter giveawayGiveaway runs between November 23rd - December 6th. You must be 18 or older to enter, and have a valid email address. Winner will be posted on this blog between Dec. 7-8th, and will be notified via the email provided. Winner has 48 hours to respond, if no response winner forfeits winnings and another winner may be chosen. Now, hop on over to the next blog on the hop, and then the next... Enter as many awesome giveaways as you have time for between now and December 6th. Feel free to share the all the giveaway's with your friends too!